Southern Blues Rock Sarasota, Florida band, Tucci, consisting of Steve "Doc" Tucci, Michael Tucci, Shawn Murphy, and Harry DeBusk, have a stellar hit with their latest 11-track release, Tucci - Olivia, featuring legendary guitarists Larry McCray and Dan Toler, and special guests Donnie Richards, Ira Stanley, Dan Ryan, and Bob Dielman. Tucci - Olivia was produced by Bud Snyder and Steve Tucci, who was also the Executive Producer, and released on the Hideaway Records label. Tucci wrote all 11 songs on the release. In the liner notes, the band writes, "As always, thanks to our good friend and mentor, Dan Toler - RIP." The release opens with the track, High Roller, which kicks it into high gear, featuring Larry McCray's deep vocals and his guitar, along with guitarist Steve Tucci, and Donnie Richards on a B3. Next in the play list is the title track, Olivia, with featured players Shawn Murphy contributing lead vocals, Ira Stanley on slide, Steve Tucci on guitar, and Donnie Richards laying down some nice segments on a B3. Once again, Larry McCray adds vocals and guitar on the slow and sultry track, I Don't Need It, with Steve Tucci on guitar, and Donnie Richards on B3. The band cranks it up on Gimme Some of Your love, which has some nice harmonies and features Larry McCray adding vocals, Steve Tucci playing all guitars, and Dan Ryan playing B3. If you are feeling the pinch of too high taxes, then you are going to love the track, Overtaxed Blues with its political economic lyrics. Featured players include Steve Tucci contributing vocals and guitar, Larry McCray on guitar, and Dan Ryan on keys. Get ready to rock Southern Blues style with the punchy Hey Florida featuring Steve Tucci contributing vocals and guitar, Larry McCray on guitar, Dan Ryan on B3, and Shawn Murphy's wailing sax. The band eases into the slow with Train Blues, which benefits from Shawn Murphy supplying vocals, and the double guitars of Steve Tucci and Larry McCray. The lament, Without You has a stellar guitar intro before segueing into Larry McCray's vocals, with Steve Tucci on guitar, and Dan Ryan on B3. Guitarist Dan "Dangerous Dan" Toler (September 23, 1948 - February 25, 1913) from Sarasota, Florida was a friend, mentor, and former Allman Brothers Band guitarist. He laid down the track Play by the Rules before ultimately succumbing to, and dying, of ALS. Play by the Rules is a lasting memory of one of the great guitarists. Featured players include vocals by Al Owen, Dan Toler on guitar, Steve Tucci on guitar, and Donnie Richards on B3, joined by the band. The band continues with the track, You Hurt Me, featuring Larry McCray's vocals and guitar, joined by Steve Tucci on guitar, and Dan Ryan on keys. The release closes with Third Eye, which is 12:04 minutes of pure listening pleasure. It opens with a 41-second guitar instrumental, slides into the lyrics, and then culminates in a killer long instrumental section that shows the exceptional talent of the players, including the spectacular 3+ minute drum solo by Michael Tucci who works his drum kit with master expertise before the band joins back in to create a stunning eclipse of a release. Shawn Murphy takes over vocals for this track and plays guitar, with Steve Tucci and Bob Dielman on guitars, and Donnie Richards playing B3. 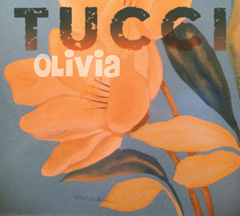 Websites where you can procure Tucci - Olivia: Tucci Band Store, Amazon and iTunes. © July 2017. Luxury Experience. www.LuxuryExperience.com All rights reserved.